Mt Damavand Iran is a giant volcano located in the central Alborz Mountains on the southern coast of the Caspian Sea and surrounded by beautiful mountains, valleys and forests. 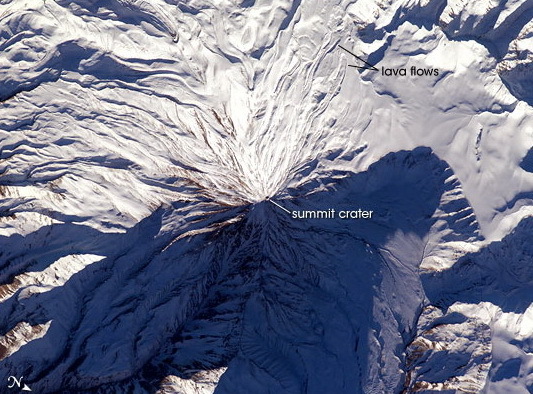 This silent dormant volcano is 5,671 m, 18,605 ft high; it is the highest summit in the Middle East and the highest volcano in Asia and the second highest volcano in Northern Hemisphere. Snow covers the entire mountain in winter and the upper parts in other seasons. Its permanent snowy white peak with its regular clouds is the most beautiful sight of Iran. At the height of 5400 meters there are some sulfuric rocks and gas making a little problem for mountaineers. More in Damavand Forum FAQs. Damawand is a perfect cone-shape volcano, its appearance looks like Fujiyama in Japan but it is much bigger. The summit has a crater about 150-200 meters across with yellow sulfurous rocks and pumice stones, the crater also contains a small pool. Visit also Damavand Weather Forcast. It is not volcanically active and no eruption has been recorded in historical times so is believed to be silent, but it is not entirely an extinct volcanic cone. There are dozens of hot springs on the lower slopes and hot sulfur gases (fumaroles) emerging near the crater. These thermal springs at the base and steam vents on the top indicate that a hot magma body is present beneath near the surface of the earth which indicates that this volcano is a little active and it is a dormant stratovolcano rather than being extinct. Visit the latest Damavand Volcanic Activity. Since spring 2007, there has been some extraordinary activities such as significant emission of gas, steam, sulfurous materials and increase in hot spring temperature. Visit remarkable Iran salt lake deserts and caravansaries, gravel routes, running sands, absolute silence and peace, stars shining in desert dark sky night. - Abar Kooh, abar Koh. - Dasht e Lut, Kavir e lout. - Desert ecosystem of iran. - Maranjab Salt Lake Desert. - Maranjab desert silk route. - Sahara and caravansaries in Iran. See also Damavand Vip Tour..
A major part of the Silk Road is located in Iran, in old ages many commercial caravans have passed this part of the persian silk road, visit iteresting remains of old and ancient caravansaries of the Iran in Yazd, Kashan, Isfahan and Tehran. Experince camel-riding and horse-riding on Silk Road, the old commercial trade road in the past which ran across much of the world from China in Asia to Europe, transporting people, goods, foods, ideas and religions, a part of this route was through anciant Persia or Iran.- Caravansary tour, remains of ancient caravansaries. - Silk Road tour, the oldest commercial trade road in the world. - Silk road Camel Riding adventure tour. We offer private tailor made tours for hiking & trekking, mountaineering, mount climbing, rock and boulder climbing tours and mountain expedition tours in Alborz and Zagros Mountain Ranges and regular tours to Mt Damavand Iran. With qalified mountain guides which are the most experienced ones in Iran, some have climed more than 100 times to Damavand peak, and the member of 100 Damavand Club or Iran Mountain Federation. More in Damavand Forum, Damavand Weather. Visit also our weblogs: Mount Damavand Guide , Iran Natur. Damavand Iran Klettertour 2015. Geführte Ski-und Snowboard-Touren in den Iran Skigebieten 2014 Wandern & Trekking Expedition Touren zu Alborz Mountains Iran. Wintersport und Ski-Abenteuer-Tour in Teheran. Outdoor-Sportmöglichkeiten, Öko-System, Stadtrundfahrten Iran. Mt Damawand Guides. Teheran Bergtourismus Informationszentrum. Historische und kulturelle Touren Persien. Sightseeing caltural Touren in Teheran. Persien Länderinfo Info-Desk. Damawand Teheran. Info, Tour, Touren, Wandern, Wandern, Wanderung, Trekking, Klettern, Bergsteigen, teheran, Ski, Skitour, Snowboard, Reisen, Reise, Spur, alborz, Zagros. Mount Damavand Iran climbing tour 2015. Guided ski and snowboard tours to Iran ski resorts 2014. Hiking & trekking expedition tours to Alborz Mountains Iran. Winter sport and ski adventure tour Tehran. Outdoor sport activities, eco system, sightseeing tours Iran. Mt Damawand Guides. Tehran mountain tourism information centre. Historical and cultural tours Persia. Sightseeing caltural tours in Tehran. Persia tourism guide info desk. Damawand Teheran. info, tour, tours, hike, hiking, trek, trekking, climb, climbing, tehran, ski, skitour, snowboard, travel, visit, trail, alborz, zagros. 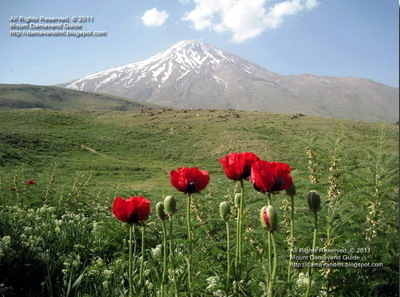 Visit also Damavand Trek. Monte Damavand Irán escalada gira 2015. esquí y snowboard Visitas guiadas a las estaciones de esquí Irán 2014. Senderismo y trekking expediciones a montañas de Alborz Irán. Deporte de invierno y turismo de aventura de esquí de Teherán. Actividades deportivas al aire libre, sistema de eco, visitas turísticas Irán. Mt Guías Damawand. Teherán centro de información del turismo de montaña. Histórico y visitas culturales Persia. Visitas guiadas caltural en Teherán. Persia información enoturismo escritorio. Damawand Teherán. información, viaje, viajes, caminata, senderismo, trekking, senderismo, escalada, escalada, teherán, esquí, Skitour, snowboard, viaje, visita, rastro, alborz, Zagros. Mont Damavand Iran escalade tournée 2015. guidées ski et de snowboard visites à l'Iran stations de ski 2014. Randonnée et trekking de l'expédition à Alborz Mountains Iran. Sports d'hiver et le ski Adventure Tour Téhéran. Activités sportives de plein air, système d'eco, des visites guidées Iran. Mt Guides Damawand. Téhéran tourisme de montagne centre d'information. Perse historique et visites culturelles. Visites guidées caltural à Téhéran. Perse infos guide de tourisme bureau. Damawand Téhéran. Renseignements, visite, visites, randonnée, trek, trekking, montée, escalade, Téhéran, ski, skitour, snowboard, Voyage, visite, piste, alborz, Zagros. Mount Damavand Iran arrampicata Tour 2015. Visite guidate di sci e snowboard per le stazioni sciistiche Iran 2014. Escursioni e trekking spedizione Alborz Mountains Iran. Sport invernali e tour di avventura sci Teheran. Attività sportive all'aperto, sistema eco, visite guidate Iran. Mt Guide Damawand. Teheran turismo montano centro informazioni. Storici e visite culturali Persia. Itinerari Turistici caltural a Teheran. Persia Info enoturismo scrivania. Damawand Teheran. informazioni, tour, escursioni, escursione, escursioni, trekking, trekking, arrampicata, alpinismo, Teheran, sci, Skitour, snowboard, viaggi, visita, percorso, Alborz, Zagros. Mount Damavand Iran klatring tour 2015. Guidede ski og snowboard turer til Iran skisteder 2014. Vandring & trekking ekspedisjonsturer til Alborz-fjellene Iran. Vinter sport og ski opplevelsestur Teheran. Utendørs sportsaktiviteter, øko-systemet, sightseeingturer Iran. Mt Damawand Guides. Teheran fjellturisme informasjonssenter. Historiske og kulturelle turer Persia. Sightseeing caltural turer i Teheran. Persia turisme guide info desk. Damawand Teheran. info, tur, turer, fottur, fotturer, trek, trekking, klatre, klatring, Teheran, ski, skitur, snowboard, reise, besøk, trail, alborz, Zagros. Демавенд Иран восхождение тура 2015 Экскурсионные лыж и сноубордов туры в Иран горнолыжных курортов 2014 Туризм & экскурсии экспедиции туры в Эльбрус горы Ирана. Зимний спорт и лыжи приключенческий тур Тегеран. Открытый спортивные мероприятия, Eco System, экскурсии Ирана. Mt Damawand Гид. Тегеран горный туризм информационный центр. Историко-культурные туры Персия. Достопримечательности caltural туры в Тегеране. Персия Туристический справочник-путеводитель информационная стойка. Damawand Тегеран. Информация, туры, туры, поход, туризм, поход, поход, восхождение, альпинизм, Тегеран, лыжи, Скитур, сноуборд, путешествия, визит, тропа, Алборз, Загрос. Demavend Iran voskhozhdeniye tura 2015 Ekskursionnyye lyzh i snoubordov tury v Iran gornolyzhnykh kurortov 2014 Turizm & ekskursii ekspeditsii tury v El'brus gory Irana. Zimniy sport i lyzhi priklyuchencheskiy tur Tegeran . Otkrytyy sportivnyye meropriyatiya, Eco System , ekskursii Irana. Mt Damawand Gid . Tegeran gornyy turizm informatsionnyy tsentr . Istoriko- kul'turnyye tury Persiya . Dostoprimechatel'nosti caltural tury v Tegerane . Persiya Turisticheskiy spravochnik-putevoditel' informatsionnaya stoyka . Damawand Tegeran . Informatsiya , tury, tury , pokhod , turizm, pokhod, pokhod , voskhozhdeniye , al'pinizm, Tegeran , lyzhi, Skitur , snoubord , puteshestviya, vizit, tropa, Alborz , Zagros .